Hi this is Juhi,I have a card to share for this month's theme. I have chosen Column 3 (C3) as my favorite four. This is my first craft project in our new house, my craft supplies are still not unpacked fully so had to make it with limited supplies. Stitching, Paper Piecing, Banners/Flags/Penchants/Charms, Patterned Paper. I've stitched around the edges and also on the bottom banner with my sewing machine. The baby dress is paper pieced. I've used patterned papers from the fresh Floral DCWV paper stack. The banners are made with washi tape. Please visit this post for details about this month's theme and challenge. 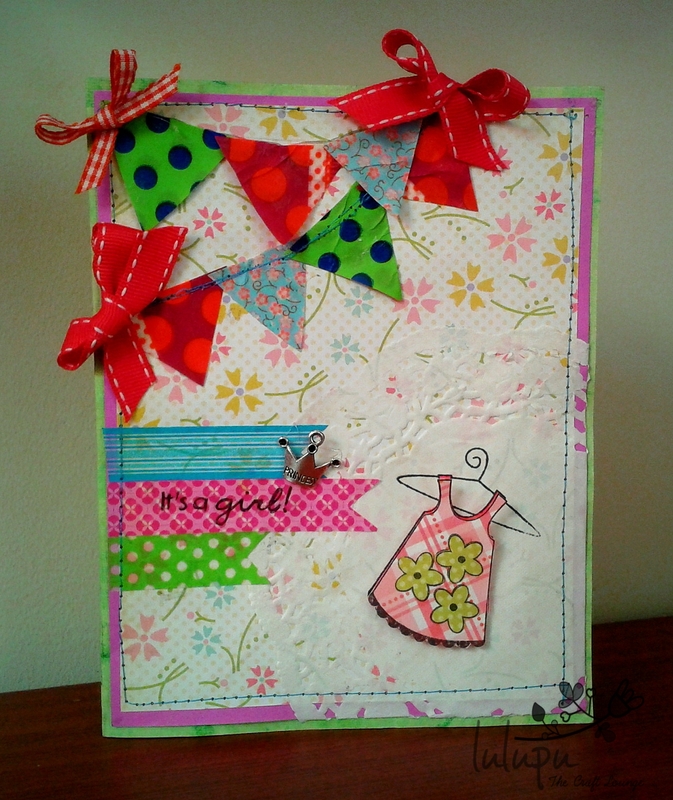 Lovely card...the dress element is really very pretty...Loved the creation. Some sad news and some good news! Lulupu.com celebrates 100 Blog Followers!